Steve’s life with Lil within earshot of “the bells of Westgate” was but a brief respite for him. It wasn’t long before the shrapnel wound to his right leg, so poorly repaired back in Aden, turned gangrenous. Part of the leg was amputated to help stop the spread of the infection. The pain that he would have suffered as a result must have marred his and Lil’s joy at the birth of their son, Leonard Ernest Gisby, in September 1922. He was probably in pain in this photograph, which was taken at about that time and in which the effect of the leg injury is evident from his built-up right shoe. 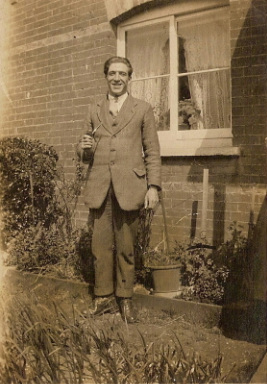 Leonard, who became known as Len, was never to meet his father. With Lil at his side, Steve died in September 1923, just short of his twenty-ninth birthday. The cause of death was pulmonary tuberculosis. More widely known as consumption, tuberculosis was a common killer in the early twentieth century. It is highly likely that Steve contracted it years earlier during his period of service in India and Aden, the disease lying dormant until his immune systems were weakened by the onset of gangrene or the surgery to counteract it. It would seem, therefore, that the Great War had claimed yet another victim. For young Steve, there would no longer be “plimsolls in the summer”, nor “galoshes in the wet”. Lil eventually remarried, but had no more children. Len went on to marry Kathleen Alexandra Fawthorpe in 1946 in West Yorkshire. Len met Kathleen, whose lifelong nickname was Terry, during the later years of the Second World War when they were both working in Yeadon at a factory producing Avro Lancaster bombers. In 1949, they had a son, Phil Gisby, who is a co-author of this family history.